by Chris Woodford. Last updated: August 6, 2018. When people wave to you through the windows of your home, you probably wave back. If so, you're using a handy property of glass that we all take for granted: it lets light pass through it pretty much unimpeded. If you have a cat, it probably curls up on your window ledges in the sunlight. If so, it's taking advantage of a different property of glass: it lets heat pass through it too. Now glass is brilliant stuff and most of the time we're happy to let light and heat stream through it in both directions without a second thought. But in extremes of summer and winter, that's not such a good idea. On hot summer days, wouldn't it be cool (pun intended) if your windows reflected back the sun's heat automatically? Likewise, in the dark depths of winter, wouldn't it be great if the windows of your home helped to stop all that expensive heat from escaping? If you have heat-reflecting glass in your windows, that's exactly what will happen. Let's take a closer look at how it works! Photo: This conservatory glass has a distinctly blueish coloring, which tells us it's fitted with heat-reflective glass (it's also self-cleaning). What's the difference between light and heat? Before we go any further, it helps if we understand a bit more about light and heat and the difference between them. Both are kinds of energy, though they behave in different ways. Sunlight contains both heat and light: it's a mixture of different kinds of electromagnetic radiation, made up of vibrating waves of electricity and magnetism, that zip along in straight lines at 300,000 km (186,000 miles) per second. Our eyes can see only a very small, very limited band of all the electromagnetic radiation that buzzes around the world—and we call this the spectrum: it's the band of light you see in a rainbow that stretches from red and orange through indigo and violet. Photo: "Yellow" sunlight is made from a wide range of different light waves, but we only really notice that when we see rainbows. 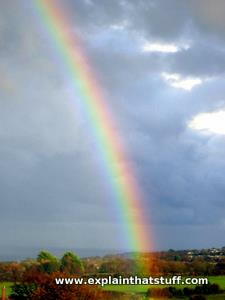 In a rainbow, drops of water split the different colors from sunlight by bending different wavelengths of electromagnetic radiation by different amounts. Blue is bent more than red, which is why it's always on the inside of the curve. 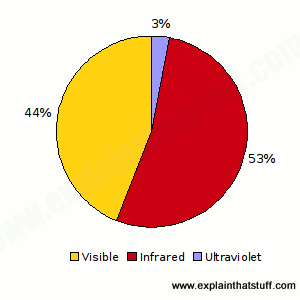 Chart: Thanks to the ozone layer, which traps ultraviolet light, the sunlight that reaches Earth is split (very roughly half and half) between visible light (yellow slice) and infrared (red slice). How is heat-reflecting glass made? Photo: How low-E glass works by treating light and heat in different ways. On hot summer days, light can pass through, but the heat from the Sun will reflect back out again. On cold winter nights, more of the heat generated inside your home will stay there instead of leaking out through your windows. Heat-reflecting windows are usually sealed, double-glazed units—ones with two panes of glass separated by a noble (unreactive) gas such as argon that improves insulation (stops heat from escaping in air drafts). The inner surface of one of the panes of glass is given a very thin reflective coating, usually made from two or more layers of metal or metallic oxide (typical metals include titanium, zinc, copper, tin, and silver, and typical alloys include brass and stainless steel). The coating has to be microscopically thin if you still want to see through your windows, but you'll notice that it does give them a slightly brown or gray color. The exact form and thickness of the coating can vary quite widely from manufacturer to manufacturer. In early coatings, it was often a layer of silver sandwiched between two layers of metal oxide. But window makers such as Pilkington discovered they could get better results with a layer of silver, a layer of metal oxide (made from a metal other than silver), and a third metal oxide layer on top. This improved "recipe" seemed to reduce the emissivity while keeping the light transmission high. Typically, the heat-reflective coating applied in one of two ways. One way is a process called sputtering, where a thin film is fired onto the surface of the glass to make what's called soft-coated glass. The other process involves heating glass to high temperatures in a chemical vapor, so the coating material condenses onto its surface. That makes what's called pyrolitic or hard-coated glass. The coating in soft-coated glass is relatively delicate (gradually eroded by moisture and air and easier to rub off), so it's used only on the inside face of sealed double-glazed units. Hard-coated glass is slightly less effective at reflecting heat though much more robust, so it can be used in single-pane windows (though that also makes it less effective as heat insulation, since the air gap in double-glazed units plays a major part in retaining heat). How does heat-reflecting glass actually work? Imagine it's a blazing hot summer's day and the sunlight is shining into your home. Heat-reflecting glass lets visible light pass through it virtually unimpeded, but the metallic coating reflects longer-wavelength infrared light very effectively, much like a mirror. So sunlight enters your home as normal, but "sunheat" is reflected back out again. Even when the sun's moved around and isn't shining directly, objects warmed by infrared and ultraviolet radiation from the sun (like houses, cars, streets, and so on) can still re-radiate infrared radiation into your home. 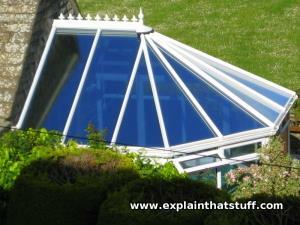 But heat-reflecting glass will simply reflect that back out into the world. With less heat entering your home, there's less need for air-conditioning, so heat-reflecting glass can help you cut your bills, even in summer. Now imagine it's a freezing winter's night. There's no light or heat from the sun coming into your home, but you've got a wood burner blazing away making your home nice and warm. If you have normal doors and glass windows, roughly a quarter of the energy you're producing inside your home will leak through them into the cold world beyond. Even with sealed, double-glazed windows, you lose quite a lot heat this way. How come? Heat from your home warms the inner pane of glass (by conduction, convection, and radiation). Now there's an air (gas) gap between the panes of double-glazed windows, so heat can't easily escape by conduction or convection. But the warm inner pane gives off infrared radiation, which radiates through the gas between the panes to the cold glass of the outer pane and the cold night beyond. If you have heat-reflecting glass, something different will happen. Like a camp fire, your wood burner will throw off infrared radiation. It'll travel out in straight lines to your windows and the metallic coating will reflect it most of it straight back into the room! How much difference does low-E glass make? Relatively little heat is lost (emitted) from windows like this—and that's why they're sometimes called low-emissivity, low emittance, or low-E glazing. You'll sometimes see heat-reflecting glass referred to as low-E2 (low-E squared), which is a marketing name for improved low-E glass. Since reflecting units allow less heat to pass through them, they have considerably reduced heat transmission (a lower U-factor) and increased heat insulation (a higher R-value) than ordinary double glazing. 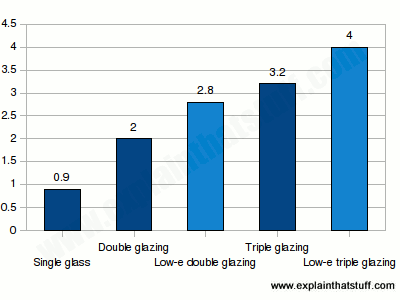 Chart: Low-E coatings significantly improve the heat insulating properties of ordinary double and triple glazing. This chart compares the R-values (a standard measurement of insulating performance) for typical windows with and without low-E coatings and with a 1.25cm (0.5 inch) air gap. Apart from using U-factors and R-values, you can also compare different low-E windows using a measurement called the solar heat gain coefficient (SHGC). If you're interested in windows that reflect the sun, you want this measurement to be as low as possible (unlike with passive solar buildings that soak up solar energy, where you want it to be as high as possible). Visible/visual transmittance (VT), which ranges from 0 (completely opaque) to 1 (completely transparent), gives you an idea how much sunlight still gets through a window that's been coated. SHGC and VT are sometimes combined in a single measurement called LSG (light to solar gain); higher values mean more light and less heat. Every new technology brings its problems, and low-E glazing is no exception: what you gain in heat insulation you might lose elsewhere. Generally speaking, the better a window reflects heat, the worse it transmits light, so there's always a compromise between what's technically called visual transmittance (letting light through) and infrared reflectance (bouncing heat back). Since they must reflect some light, low-E windows with metal coatings cannot be perfectly transparent, and their (typically) blueish-green color might not be to everyone's liking (or appropriate for every kind of building). Low-E coatings tend to be quite fragile (since they're so thinly applied); they can get scratched during manufacture or installation or they can wear off naturally through weathering or through the gradual deterioration of other window components. Finally, low-E windows are obviously more expensive than ordinary glazing and it's important to ensure that the extra cost is justified by good energy savings. Thankfully, the payback time is quite short, typically 2–6 years. You might see a few other variations on the basic low-E theme. As their name suggests, spectrally selective coatings are designed to reflect infrared wavelengths more precisely with little or no effect on ordinary, visible light; the idea is to get the benefits of low-E without the drawbacks. Photo: Low-e visor? Not exactly, but it's a similar principle: the Apollo astronauts wore helmets with visors that had a gold coating 0.3 millionths of a meter (0.3 μm) thick to block solar radiation. 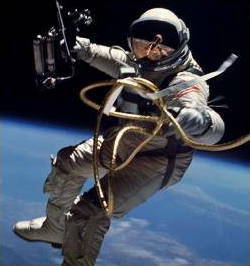 This is Ed White making the first American spacewalk in 1965. Photo by courtesy of NASA on the Commons. Most historic accounts of this technology will tell you that the first low-E windows were developed at the US Department of Energy's Lawrence Berkeley National Laboratory in California between 1976 and 1983, in the wake of the 1970s oil and energy crises. To begin with, LBNL's scientists developed a plastic film that could be fastened to ordinary glass, later coming up with the idea of durable coatings that could be directly applied through processes such as sputtering. The UK company Pilkington started developing its popular low-E Pilkington K Glass™ at around the same time, with its first US patent on the technology granted in 1984. But these weren't the first efforts to make a low-E window. Digging through the US Patent and Trademark Office database, I traced a number of earlier attempts, including US Patent 3,781,077: Heat-reflecting window pane, filed in June 1971 by German inventor Rolf Groth. The gold film he used to reflect heat had the unfortunate drawback of reducing light transmission to just 20–60 percent (70 percent at best), compared to modern low-E windows that achieve about 80 percent transmission, and introduced a certain "cloudiness" as well. There were numerous earlier efforts. Monsanto filed US Patent 3,069,301: Heat-reflecting laminates in 1958, which was around the time that NASA developed the first modern space helmets with their famous gold-coated visors. Monsanto's patent references (as "prior art") a tinted-glass windshield (US Patent 1,990,143: Antiglare device and method of making it) patented in 1935 by Philo Snow of Chicago. So far as I can see, the roots of today's low-E technology seem to lie in tinted glass and optical filters as much as in energy efficiency. Energy-efficient windows: Independent advice from the US Department of Energy's Energy Savers website, comparing various different types of eco-friendly windows. The Dawn of Solar Windows by Andy Extance. IEEE Spectrum, January 24, 2018. Are low-e windows a thing of the past? Future windows are likely to capture unwanted light and heat energy instead of simply reflecting it away. Replacing Windows to Save Heat by Jay Romano. The New York Times, January 28, 2001. Another old but still relevant article that compares a variety of energy-saving window technologies, including low-E, foam-filled frames, and multiple panes of glass. High-tech windows by Fran Donegan, Popular Mechanics, June 1993, p.79. 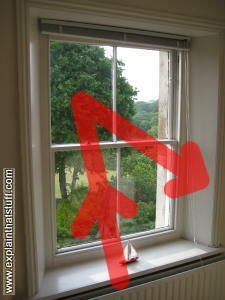 An old but very clear introduction to different kinds of low-E windows and how they compare. Solar Energy: The State of the Art by Jeffrey M. Gordon (ed). Routledge, 2013. Chapter 2, "Glazings and Coatings", p.29, by Terry Hollands et al, is a technical exploration of how well glass windows can perform in buildings with and without coatings, including detailed mathematical theory. Green from the Ground Up: A Builder's Guide by David Johnston and Scott Gibson. Taunton Press, 2008. Introduces the basics of environmentally friendly buildings, then has separate chapters covering the green aspects of roofs, windows, plumbing, insulation, and so on. Energy-Efficient Building by Fine Homebuilding/Taunton Press, 1999. A good overview of making an existing building more energy efficient. Energy Research at DOE: Was It Worth It? Energy Efficiency and Fossil Energy ... by Committee on Benefits of DOE R&D. National Academy Press, 2001. For those of you interested in the history of this technology, Appendix E, p.114 of this report, "Low-emission (low-E) windows," describes and assesses LBNL's original low-E window development program. US Patent 4,462,883: Low emissivity coatings on transparent substrates by Frederick H. Hart, Pilkington Brothers P.L.C. July 31, 1984. One of the original Pilkington patents on low-E glass. US Patent 4,943,484: Solar control glass assembly and method of making same by Ronald D. Goodman, Libbey-Owens-Ford Co. July 24, 1990. Describes automobile glass with a metallic coating that reduces solar heating without making a car too dark. US Patent 5,413,864: Low emissivity film by Masami Miyazaki and Eiichi Ando, Asahi Glass Company Ltd. May 9, 1995. Describes a heat-reflective low-E film (made from oxide and metallic layers) that can prevent heat loss from windows in cold climates. US Patent 5,344,718: High performance, durable, low-E glass by Klaus W. Hartig et al, Guardian Industries Corp. September 6, 1994. A sputter-coated, multi-layer system made from silver, nickel, and silicon nitride. US Patent 5,557,462: Dual silver layer Low-E glass coating system and insulating glass units made therefrom by Klaus W. Hartig et al, Guardian Industries Corp. September 17, 1996. Describes a multi-layer design with very low emissivity.